Visit this 17th Century Luxury Eco-farm, the home of the Plaza family, who come from a long line of gifted horsemen. Hacienda Zuleta is an Ecuadorian hotel that lies in the spectacular Andean mountain range of Ecuador at 9,600 feet (2,800 meters) above the sea level, and only two hours north of Quito, the capital of Ecuador. This colonial hacienda, a working farm on 4,000 acres (2,000 hectares), has belonged to the family of Mr. Galo Plaza lasso, a former president of Ecuador, for more than 100 years. It was chosen as one of the world’s “Top Ten Finds” by Outside Magazine and named as one of the best Ecuador Hotels by National Geographic Traveler. 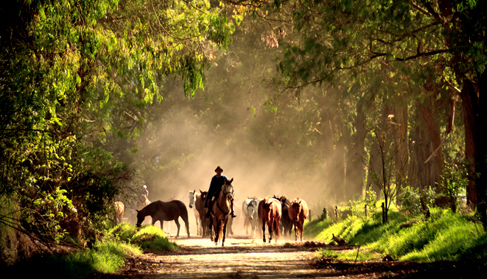 Horseback riding in Ecuador has been a Plaza family tradition for over one hundred years, and today Zuleta reflects this equestrian lifestyle by boasting one of the most exclusive stables and horse riding vacations in Ecuador. Hacienda Zuleta is known not only for its prize winning pure Andalusians, including national champions and precious stallions, but especially for its very own breed––the Zuleteño. The Hacienda was the first to bring purebred horses to Ecuador, starting with Quarter Horse and Thoroughbred and changing to Andalusians in the early 1960's. The Zuleteño is a combination of those three breeds and known for its qualities as a very noble, gentle and versatile horse. 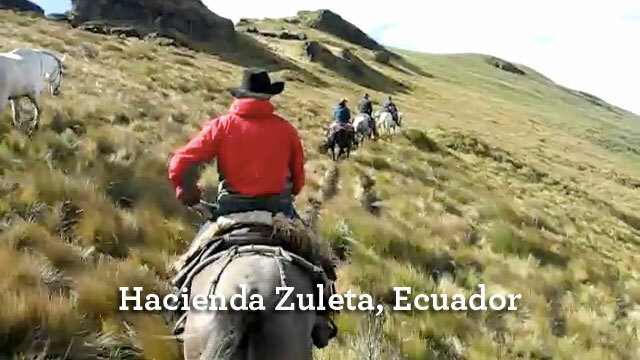 The Zuleteño is a robust, noble and smooth Andean horse with a perfect disposition for trail riding. 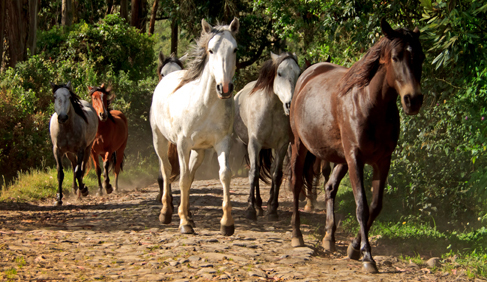 Many guests come specifically to Zuleta for 3 to 10 day horse riding holidays. 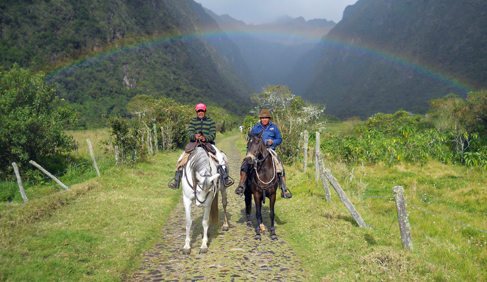 A bilingual riding instructor is available for your questions and comfort on these Ecuador riding vacations. For more information or to book a reservation, Email Hacienda Zuleta. Visit Hacienda Zuleta's website. This working ranch and 17th century colonial hacienda has superb views of the Andean Mountains and snow capped volcanoes that you can see on an Ecuador horse tour. Enjoy excellent, home-grown food from the organic garden, cooking classes, Indian markets and community visits. View endangered species, area archeology, enjoy walking and hiking, friendly dogs, handmade embroidery, massage, kid-friendly activities, horse riding, horse drawn carriage rides, horse drives and herding horses in the mountains, mountain biking, bird watching, trekking and learning about life on a working hacienda. 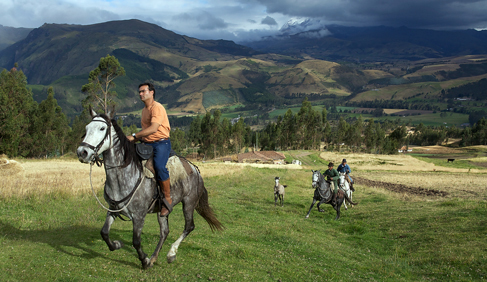 Hacienda Zuleta has all levels of horses, from beginner to advanced for Ecuador riding vacations. You will ride on comfortable Western tack, to which extra cushioning is added for longer rides. Bridles and saddles are handmade locally. The 5,200 acre estate has 3,000 sheep, 600 head of dairy cows and 120 horses. This Ecuador eco lodge has very comfortable suites, bringing guests rustic luxury–– Deluxe and Standard rooms with King, Queen and Twin beds, plush comforters, feather and hypoallergenic pillows, fireplaces and beautiful garden and mountain views. While guests are enjoying their dinner, room service staff place hot water bottles with beautiful embroidered cases in every bed and light the fireplaces. Wifi is available in some parts of the farmhouse and a computer with 24/7 internet service is also available for guests. Enjoy the excellent cuisine of Ecuador, including superb home grown cheese, fresh rainbow trout and dishes made from recipes passed down from the hacienda's great-grandmothers. 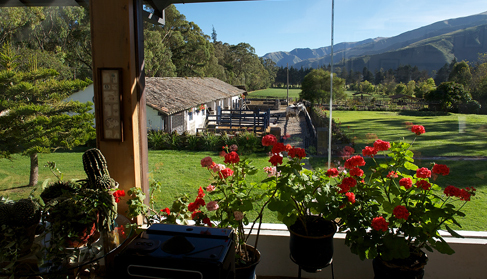 This sustainable Hacienda invites you on a guided visit of Zuleta’s cheese factory and organic vegetable garden. Take your time to taste a fresh carrot or cape gooseberry. Wander through the stunning fields of flowers and see the paramo garden on the way to the barn, where your horses are already waiting for a new adventure. In addition to the wonderful horse riding on your Ecuador riding vacation, Indian Markets, local communities, Hacienda Zuleta's own dairy farm, organic garden and cheese factory. The beauty of the colonial hacienda, cobblestone roads, archeology, natural habitats, amazing views, friendly personnel, lakes and volcanoes. 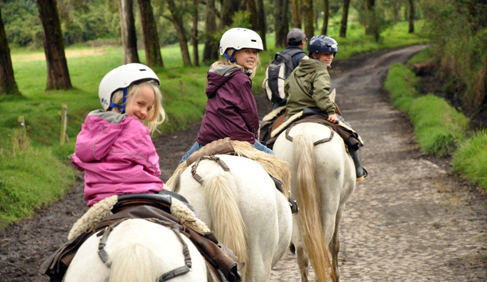 As the Hacienda consists of thousands of acres of farm land, pasture and forest, including rivers, mountains and a huge Páramo reserve, you can spend full days just riding from one end to the other and exploring all the valleys, slopes and hills. The majestic Andean condor will be flying above you. You can meet foxes and see bears on the trails in the forest, alpacas and thousands of sheep up on the high plateaus and definitely hundreds of big dairy cows on their walk to the milking sheds. Enjoy meeting local saddle makers, herding horses and mountain treks with picnic lunches on the trails. 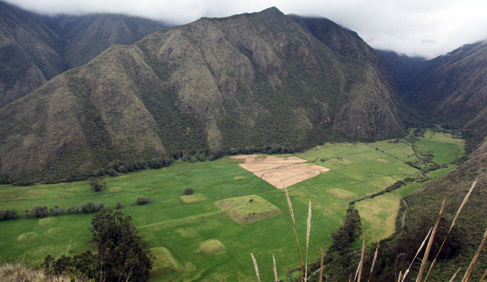 Some of the trails will lead you to Zuleta Village, where women wear their traditional indigenous clothing. People work their fields the old way and wave as you ride by. Horses and donkeys are still used for transportation in this area. The local carpenter extends his workshop to the main road and on every second doorstep someone is creating embroidery. It's a horse ride back in time! 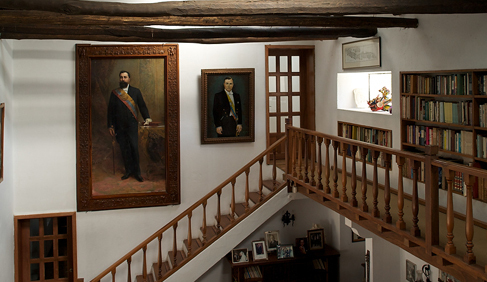 Contact Hacienda Zuleta for sample itineraries and more information. 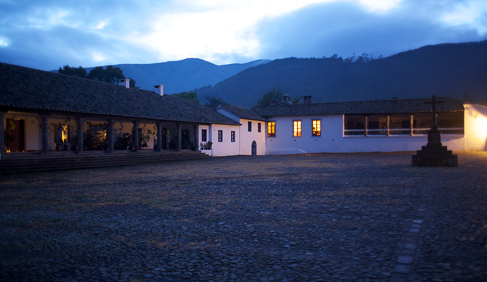 Hacienda Zuleta has been recognized by National Geographic, Conde Nast Traveler and dozens of other publications as one of the most exciting and authentic places to visit in South America. 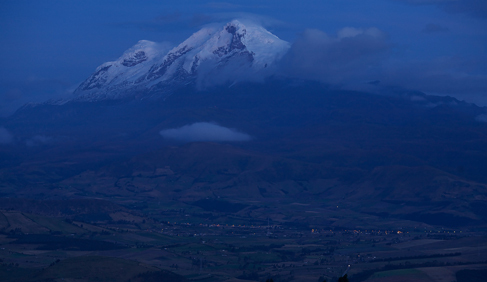 Ecuadorean Andes. 2 hours from Quito, Ecuador's capital city. Western- Beginner to Advanced welcome. Cash, Check Credit Cards. Rates from $225 per person.